Our daguerreotype was most likely a purchase by Professor Adams during the visit to Boston by Barnum’s circus in late 1850-51. 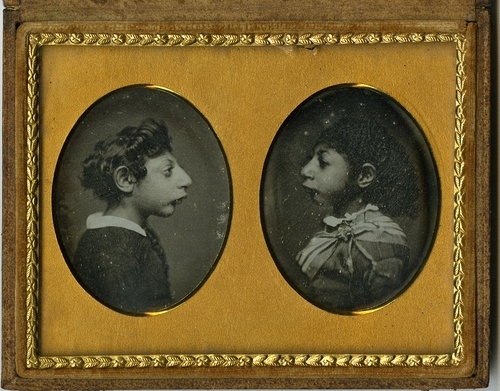 The daguerreotype, perhaps one of many sold during the tour, was taken by Beckers & Piard of New York, ca. 1850. The half-legible inscription (in Adams’s hand?) pinned to the velvet liner says: “Aztec Children. The boy weighs 20 lbs; is supposed to be about 15 years old. The girl weighs 17 lbs; is supposed to be about 12 years old.” The rest is frustratingly illegible, even in Photoshop.